This PDC Premier course includes the PDC Class III & IV. The PDC 50 metre Commercial Air & Nitrox diver is the highest level of commercial air diving that a diver can take. This is the minimum qualification a diver needs to work offshore in the oil and gas industry and is also the best qualification for inshore civil’s construction diving. 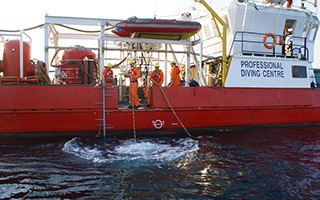 This qualification allows the diver to use hydraulic and pneumatic power tools; high pressure water jets and do underwater welding and cutting; hand tools; thermic lances; explosive tools; air lifts; LP and HP compressors; operate deck decompression chambers; manage air quads; hot water suits; dry suits; surface decompression with oxygen; diving baskets and stages; wet bells type I and type II; do dives with over 20 minutes decompression; inspection and measurements; photography and CCTV inspection; explosive procedures underwater; surface supply diving control panels; underwater dredging; understanding of therapeutic decompression tables; principles of closed and semi-closed circuit breathing apparatus; operate a deck decompression chamber during surface decompression and therapeutic treatments; understand the permit to work systems, and much more. This is the best commercial diver course to do for a successful future diving career and at PDC we do not run a sausage factory, quality is what you need and you can only get it in small classes at PDC. Many dive schools claim all sorts of things about dive work and you should look at this carefully facts are fact and marketing hype is hype, it is your choice. No school in South Africa has a reputation like PDC Durban and offers training anything like the PDC Premier Course. Take a look at www.longstreath.com as well. Some divers decide to redo their training at PDC. Why not just start with us and give your career the boost it needs. Cost: Please contact us as we are running regular special offers. Have completed 30 metre Scuba course (for 4 weeks) and 30 metre Surface Supply course (for 4 weeks.) recognized by the IDRF and HSE. 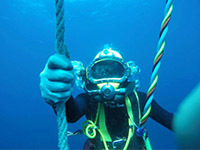 Have an in-date South African Commercial diving medical examination as per South African Diving Regulations.